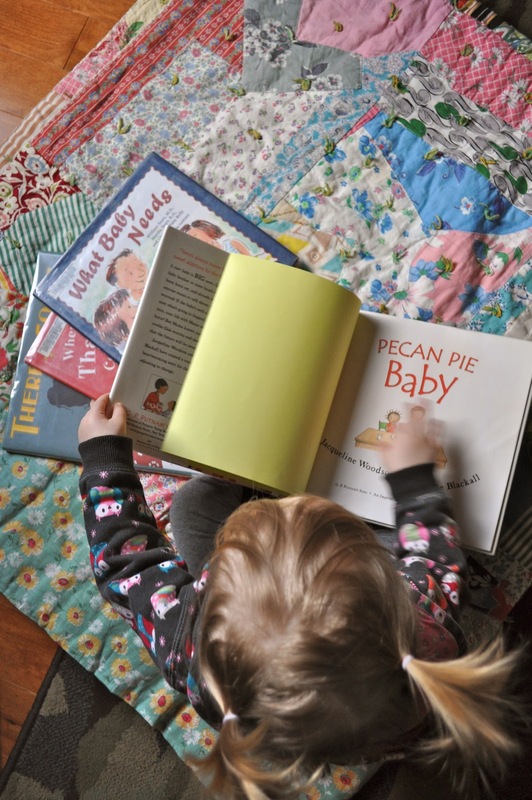 All About Books – You’re Going to Be a Big Sister! This post made its’ first debut at The Adventures of Lactating Girl in February and then again on The Artful Mama this past spring, both during their own babymoons! To celebrate our latest little blessing Jemma and I trekked to the library to find some books about becoming a big sister. Jemma is a total book girl. Most days she forgoes toys to flip through books and magazines. She “ooos” and “ahhhs” at animals, families, nature scenes, and goes crazy for books with touch ‘n feel features :) So, although she is just 16 months, I figured books would be the best way to begin talking about the new baby that will be moving in this August. Of course, Jemma adored Where Did That Baby Come From? since it featured kitties. I loved the illustrations in There’s Going to Be a Baby and What Baby Needs was very attachment friendly as it showcased babywearing by both parents, nursing, and cosleeping. But, best of all was Pecan Pie Baby! I won’t ruin the story, but will tell you that I appreciated the way the mama responded to her child’s concerns about a new baby. This mama found a common ground for the three of them (mama, toddler, and baby) to connect is a special way. It was super sweet and I hope to find a similar way for Jemma and I to envelope a new baby into our special bond. I’m sure this isn’t our first round of big sister books and I’d love to hear your recommendations! Please share your favorites – our library card is waiting to be put to use again! Will December Be Baby Month? Ooh I loved reading "Where Did That Baby Come From" to Bishop. My other favorite, although the title isn't appealing to you in those final weeks, is "There's a House Inside My Mommy" By Giles Andreae. I can still remember the first few pages by memory. "There's a House Inside My Mommy where my little brother grows, or maybe it is a little sister, no one really knows. My mommy said I lived there too when I was being made, but I don't remember very much about it I'm afraid." Ahh the best! I just decided I need this in my library I loved it so much. Maybe amazon will have it used! Going to go look. I love this post!! We gave Isabelle "There's Going To Be a Baby" when we told her about Brees and she loved reading it. You are such a thoughtful mama in everything you do! Oh, thanks :) I don't feel so thoughtful all the time, but when I have a good moment I like to capture it :) Jem loves books, so it seemed like a natural way to ease into the idea of a sibling. helen oxenbury always does it right.